Last week is the week where everyone of us received parcels from different courier services. I bet you all know it's the week where we will received our beauty box. Today beauty box series will be featuring Wonderbox Malaysia. I had a lot to say about this company this month. Read on to find out more interesting stories. Again some of you may ask what and how does this beauty box subscription works?? Every month, you need to pay a certain subscription fee amount for a box which inclusive of 4 - 5 beauty samples and products to deliver to your doorsteps. This is the Wonderbox March Edition. One glance, the box look kinda empty and light. But small and light doesn't mean is not good right? Let's take a look of the products I got. This is my first time encountered this product. 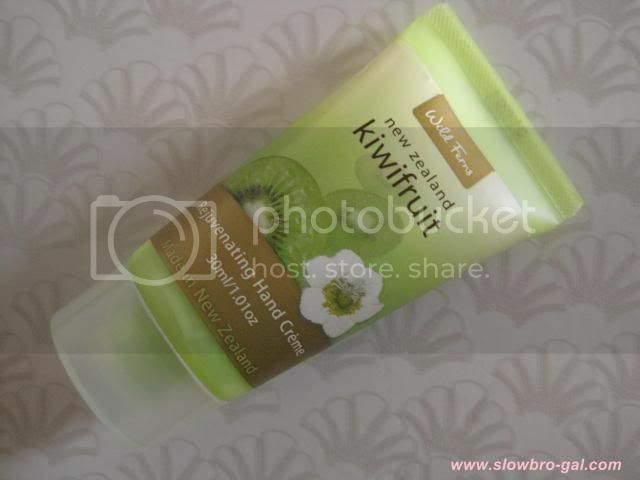 I did some research online and found that this hand cream is a local brand product from New Zealand. The hand cream was sold in two different sizes, one in jar 85ml and the one I had 30ml. So I do consider this as a full size item. I have yet to try them but it does look promising. As a blusher junkie, I won't say no to any extra blusher I received. I am sure many of you heard about the brand Elianto. Their makeups are quite affordable with the price. I have yet to try their blusher but I have to say their eyeshadow brush is good. Give it a try if you have a chance to. I love sunblock!! Ever since I started using sunblock last 2 years, I now wouldn't step out of my house without one. If you're using whitening product, sunblock is definitely a must. Let's see how this little sunscreen works. How do you find the contents of this Wonderbox? Honestly, I am a bit disappointed with this month's box. 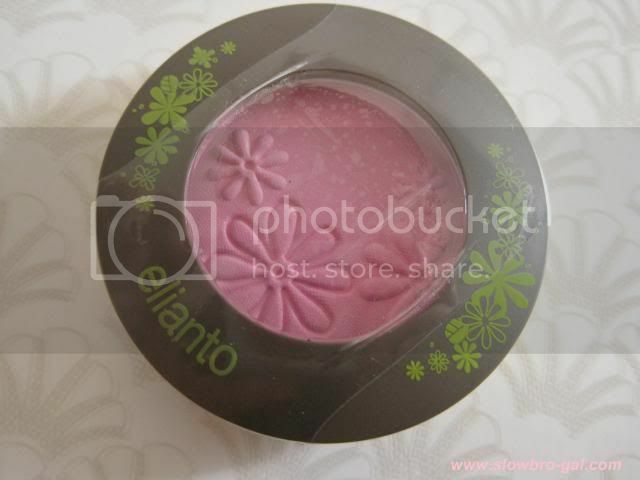 Although yes, out of 5 products, 2 were in full size items (Wild Ferns/ Elianto) is pretty worth it. 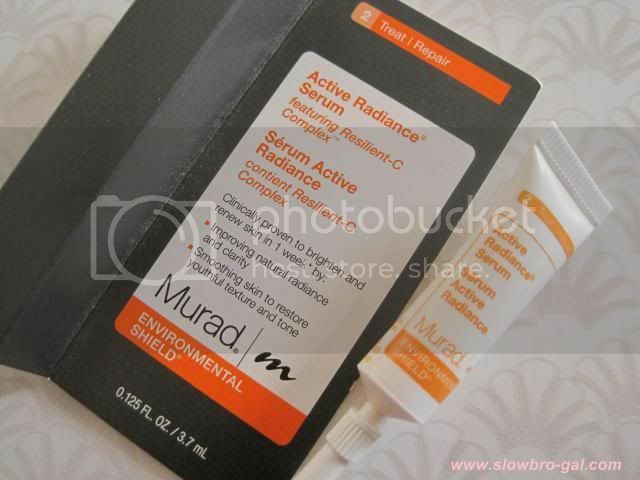 But getting 3 samples from the same brand (Murad) is a bit boring. 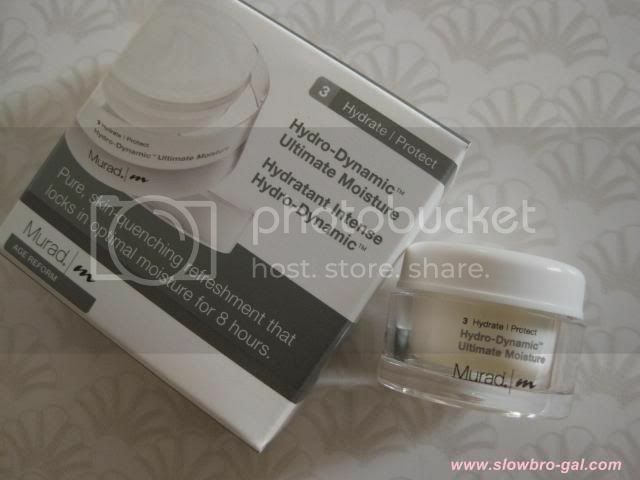 Thus, I've been receiving Murad samples consecutively for 3 months since their January box. 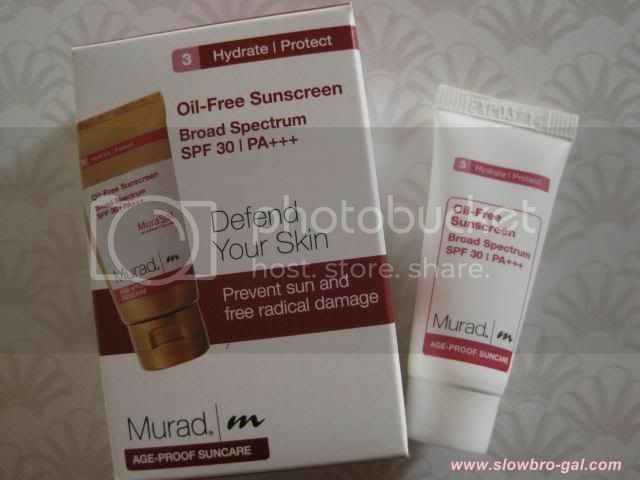 It's pretty fine for me to receive the 3 samples from Murad in a month, but consecutively for 3 months?? Nay! The reason why we subscribe for beauty box is because we wanted to try out different products/brands. So this definitely defeat the purpose of us subscribing and paying RM39.90/month. 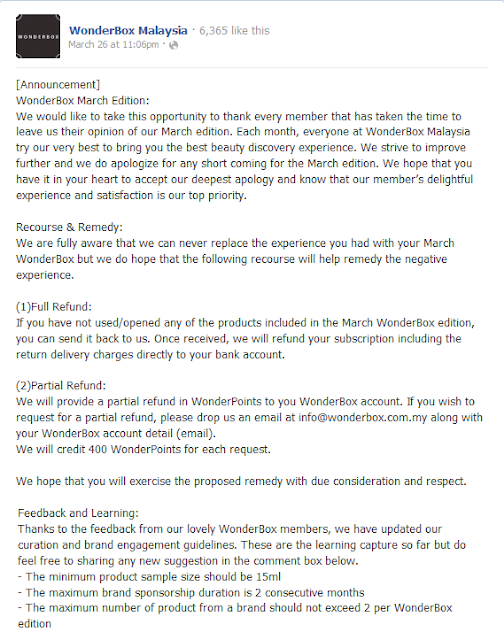 Despite of all the negative feedbacks on the March box, Wonderbox team has responded to our feedback as below. I am pretty impressed with their level of service and how they displayed their professionalism in managing the customers' feedback. Kudos to Wonderbox crew! I won't be sending my box back to them and I am still unsure if I want to do a partial refund. But I am very happy to say that their crew had gain my confidence to continue my April subscription. Did you subscribe for Wonderbox? Tell me what do you think about it. Eeee I wished I received the kiwi cream instead of honey! I'm pretty disappointed but looking at it from a more positive perspective, I still get to try everything! Although the serum is only enough for two application.